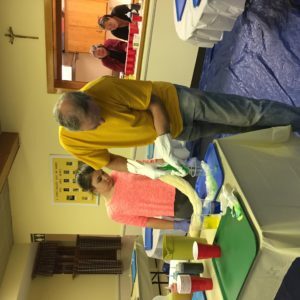 Our next meeting will be held on Wednesday, April 18, 2018, at 7:00 pm, at St Theresa, the Little Flower Church, 15 Still River Road, Harvard, MA. 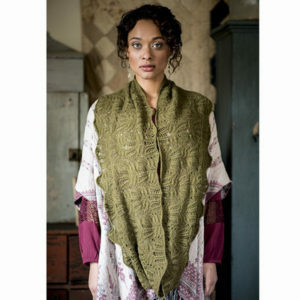 On the agenda for the evening is the ever popular Dyeing with Ivy Brambles Workshop. We had to change the date for the meeting because this was the only time we could schedule Jerry Catt. If you haven’t already, please send an email to Elaine Swee indicating the type of yarn and the number of skeins you are planning to purchase so that she can give Jerry an estimate of how much yarn to prepare and bring to our meeting. He usually brings extra yarn in case you would like to purchase some additional skeins. Remember, membership dues are $25 a year. Guests may attend this meeting, but will be charged $5 to participate. As usual, we are holding attendance raffles. The more meetings you attend, the better your chances are of winning! Due to the predicted snowstorm, we are postponing our meeting to Wednesday, March 14, 2018 at 7:00 PM at St Theresa, the Little Flower Church, 15 Still River Road, Harvard, MA. The agenda for the evening is Charity Knitting. There are lots of options for charity knitting and crocheting and we will discuss these at the meeting. The most popular items in need are as follows: hats of all sizes, mittens of all sizes, scarves, premie hats, chemo caps (for women and men – knit or crocheted in the round and made from very soft yarn), and small blankets. The yarn should be machine washable and dryable, such as acrylic, acrylic/wool blends or cotton. 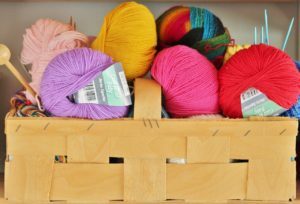 Please choose one or more projects that you would like to make and bring the yarn, needles/hooks and pattern(s), so that we can work on them at the meeting. 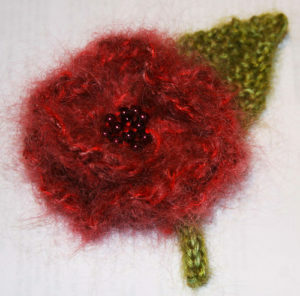 Below are a few suggested free patterns, but there are many more on ravelry. I’ll print a few for those who are not able to access ravelry or print. If you have any unwanted yarn appropriate for charity knitting that you would like to donate, please bring it along. Carolyn Campbell came up with the idea that we each knit a scarf from one of Judith Durant’s One Skein Wonders books and wear them to the May meeting when Judith will be doing a presentation for us. If you have one of her books, please bring it to the the March meeting so we can decide if this is something we would like to do. Her books are also available at most libraries. Lynn has offered to write us a guild scarf pattern. She will have it ready for the May meeting. Don’t forget about the attendance raffles. The more meetings you attend, the more chances you have of winning! 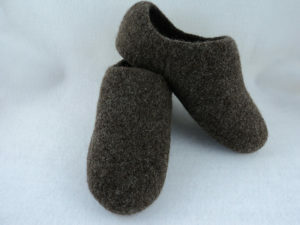 If you have finished your felted slippers, please bring them for “show-and-tell”. Our next meeting will be held on Wednesday, February 7, 2018, at 7:00 pm, at St Theresa, the Little Flower Church, 15 Still River Road, Harvard, MA. 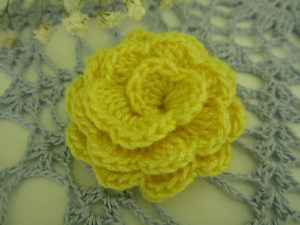 Lynn will be teaching us how to make knitted and crocheted flowers. A Rose by Any Other Name and Rolled Rose are the patterns she is planning to use. You can print out one, or both of them. Lynn has copies to hand out for those who are not able to print. Please bring to the meeting small amounts of yarn in any weight that you desire and the appropriate size needles and/ or hooks. This is a great project for using up those odds and ends! Guests are welcome, but will be charged $5 due to the workshop. Remember, membership dues is only $25 for the year. Back by popular demand are the attendance raffles. The more meetings you attend, the more chances you have of winning! Our group welcomes knitters of all skill levels, including beginners. Do you only crochet? We welcome you as well. For more information, please contact Sheilah Johnson (978-833-7035) or Lynn Cooke (508-631-1972). Our next meeting will be held on Wednesday, January 3, 2018, at 7:00 pm, at St Theresa, the Little Flower Church, 15 Still River Road, Harvard, MA. On the agenda for the evening is a class on making felted slippers. 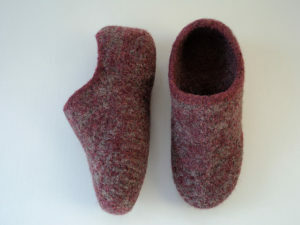 The patterns are by Monique Rae ( Ravelry – $4.95 ) and called,”Women’s Felted Slippers Knit Wool Pattern” and “Men’s Felted Slippers Knit Wool Pattern”. If you are not able to get the patterns from Ravelry, you can purchase them at the meeting. Materials needed are size 11 circular needles – 15″ and 29″ . If you don’t have the 15″ needles, you can use double pointed needles. Yarn needed is 2 skeins of worsted weight 100% wool yarn or 2 skeins of Bulky weight 100% wool yarn. Suggested yarn is Brown Sheep yarn or anything similar as long as it is not super wash wool. Bring markers and please check your gauge. 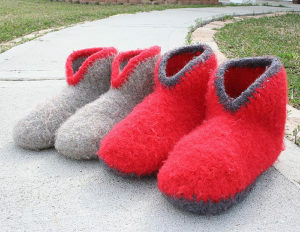 There is also a crochet pattern for slippers (on Ravelry) called “Fiber Trends Crocheted Felt Boot Slippers” by Bev Galeskas. Copies of this pattern will also be available for purchase at the meeting. Our next meeting will be held on Wednesday, December 6, 2017, at 7:00 pm, at St Theresa, the Little Flower Church, 15 Still River Road, Harvard, MA. Following tradition, we are having an optional Holiday Yankee Swap at 6:15 pm. If you would like to participate, please bring a wrapped knitting themed gift worth up to $20. If you prefer not to attend the Yankee Swap, please arrive at 6:45 pm for a brief meeting before we get into the plarn project at 7:00 pm. 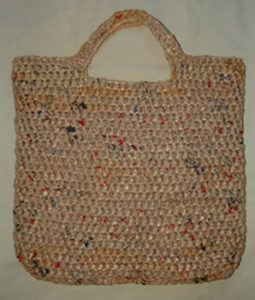 Plarn is a yarn made of plastic grocery bags. Please bring plastic bags (the thin kind) and a pair of sharp scissors. 30-40 bags will make a good sized ball of plarn. Bags with writing on them come out speckled. If you have more than 30-40 bags, please consider sharing them with others at the meeting. There are bags available on Amazon as well (some with colors). Knitting AND crocheting patterns will be given out at the meeting plus full directions on making plarn. Some of the patterns are for a bird house and a bag. You will need size 8, 9 or 10 needles/hook to work with plarn. It is similar to worsted weight yarn. You can choose to start it at the Guild meeting or work at home on a project. Some of the patterns are a bird house, baskets, totes, etc. If you do not want to make plarn, please bring a knitting project. Guests are welcome, but will be charged a $5 fee for the evening. Remember, membership dues is only $25 for the year. The guild is inviting members and the public to a special evening with Berroco rep Andra Asars, Wednesday, November 15, 2017, 6 to 9 p.m, to be held at The Fiber Loft, 9 Mass. Avenue, Harvard, MA. Andra will be hosting a “Try-On Trunk Show.” She will be bringing more than two dozen of her personal garments, knit in various Berroco yarns. She’ll also have samples of four new yarns: Quechua, Bento, Millefiori Big, Catena. Participants are welcome to put these on some needles and take them for a “test drive.” Bring needles in sizes 5, 8, and 11 if you’re interested in trying the yarns. The Berroco Quechua Trunk Show will also be featured. Quechua is a beautiful yarn made up of a blend of extra fine Merino wool, baby alpaca and yak. NVKG members and the public are invited free of charge. If you’d like to join the Guild that night, there is a $5 discount off the regular membership dues of $25. Please spread the word! 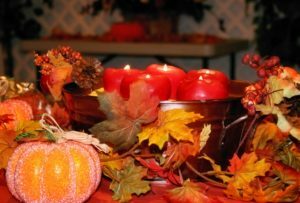 Our next meeting will be held on Wednesday, November 1, 2017, at 7:00 pm, at St Theresa of the Little Flower, 15 Still River Road, Harvard, MA. Please join us as we welcome back jeweler Leslie Wind. Leslie makes fine handcrafted jewelry and tools for fiber artists in gold, sterling silver and bronze. Come see how she makes the jewelry, which will be for sale. Also on the agenda for the evening is a yarn swap. Search your stash for that yarn you just don’t know what to do with and bring it along. Guests are welcome, but will be charged a $10 fee. Remember, membership dues is only $25 for the year. Our next meeting will be held on Wednesday, October 4, 2017, at 7:00 pm, at St Theresa of the Little Flower, 15 Still River Road, Harvard, MA. 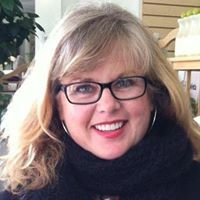 Please join us for another felting class with Tammie Davis. Kits will be provided with supplies. The cost of the kits are $5. Guest are welcome. Remember, membership dues is $25 a year. Our first guild meeting of the year will be held on Wednesday, September 6, 2017, at 7:00pm. 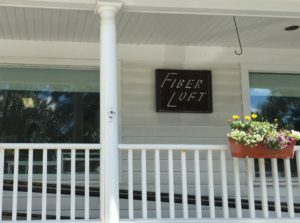 Instead of gathering at The Little Flower Church, please join us at The Fiber Loft, 9 Massachusetts Ave, Harvard, for a laid back, fun evening. On the agenda for the night are highlights of what we have planned for the year ahead, and a mini-class on hand exercises for knitters. 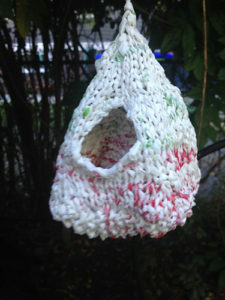 Then, sit back, knit or crochet for a while, and browse the store, which will be open for purchases. Remember, all guild members receive a 10% discount on yarn. Membership dues are $25 a year. Guests may join us at no charge for the evening. Our next meeting will be held on Wednesday, May 3, 2017, at 7:00 pm, at St Theresa of the Little Flower, 15 Still River Road, Harvard, MA. Please join us for “The Life Cycle of Wool” with Janet Hampson, the former owner of The Woolpack in Acton. Janet is going to share many interesting tidbits about yarn and it’s life. Please be prompt and bring size 8 needles. Janet will supply the yarn. Questions will be taken at the end of the presentation. Since this the last meeting of the Guild this year, we hope you will want to rejoin for next year. Our treasurer, Elaine, will be happy to sign you up for next year. Please let us know how you liked this year and if there is a topic you’re interested in or maybe you’d enjoy more get togethers without a speaker. Thank you for your support and remember, everyone is an important part of our success. Our membership dues is $25.00 a year. Sign up early for a $5.00 discount. Offer ends June 1st. Bring along the yarn you dyed at our last meeting to show off your work of art! Guests may attend the evening at no charge. We are privileged to host A Hundred Ravens on Saturday, June 24th, 11:30 am-3:30 pm. If you wish to join our session, please let Sheilah Johnson know no later than May 3rd. 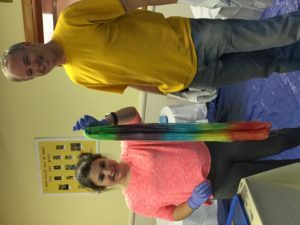 This workshop is on Gradient Dyeing, and open to 20 people. The cost is $65.00 and will need to be paid for by June 1st. As usual, we will have the attendance raffle. Come to the meeting for your last chance of the year to win a prize!